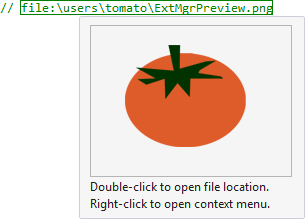 Visual Assist build 2258 is the first of the new calendar year and evidence of a return to normalcy at Whole Tomato. Last year’s dealing with bugs in the Fall Creators Update was an unwelcome distraction. Long-time users of Visual Assist know that Open File in Solution (OFIS) has been a mainstay of Visual Assist since the product’s inception. Yet, there seems always room for improvement in the feature. With build 2258, the OFIS dialog now accepts target character positions when specified with a line number. The improvement better accommodates copying of diagnostic locations from build logs directly into the dialog. OFIS (Shift+Alt+O) also recognizes when the current solution is in one of many directories under a git root, and expands the domain of searchable files to all files under the root—not just those within the current solution. Use the Ctrl+D toggle in the dialog to show/hide the relevant files. For those who set bookmarks or manage to-do’s using VA Hashtags, you can now navigate the tool window of hashtags even though focus is in the edit field. Use Up-, Down-, Left-, and Right-Arrow to navigate nodes, and Enter to open/close or jump to a location. Also with build 2258, game developers with Unreal Engine 4 (UE4) get better parsing, italics for local engine installations, smarter Create Implementation, and enabling of support for UE4 via the options dialog of Visual Assist. Build 2258.5, with its bug fix for the options dialog, requires software maintenance through 2018.03.06. Build 2258 requires software maintenance through 2018.02.20. Check out the complete list of what’s new in build 2258; learn about character position in OFIS, hashtags navigation, or support for UE4; or dispense with more reading and download the installer for build 2258.5.